Not to be confused with photomicrography, Microphotography involves taking photographs on very small film to produce small images that can only be viewed when magnified. Whereas photomicrography simply involves taking pictures (photographs) using a microscope, Microphotography is the process through which the size of a photograph is reduced so that it can only be viewed using a microscope. 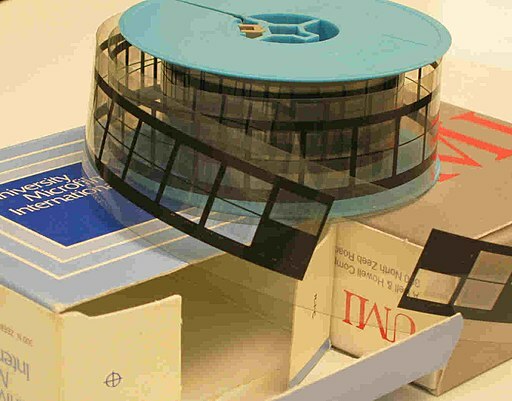 Because of the technique allows for a significant reduction in size of photographs, it has proved to be particularly beneficial for many libraries that are today using it for documentation. In microphotography, the photographer uses a special negative known as a microfilm to preserve the images. Here, the subject to be photographed (documents etc) may be photographed in one of two ways; a linear array or a two dimensional array. The ordinary microfilm roll is a good example of linear array micrograph. The standard film measure 16mm, 35, 70mm or 105mm in width and may be perforated on one or either edges. Whereas the 35mm perforated film can be used in 35mm cameras, the unperforated one can only be used in special cameras that have no sprocket wheels. The 35mm film is particularly preferred not only because it's economical, but also because it has been shown to be easier to use. Typically, the photographer photographs consecutive pages of the document by capturing a single or a pair of pages (two pages of open books). In this case, the microfilm frame will either take a single page or two pages. This process allows the photographer to capture images of an entire book in a microfilm roll, which can then be saved for copying when needed. Given that microfilm rolls tend to be of greater lengths, microfilm strips which are composed of six frames can also be used. For reading purposes, microfilm strips have been shown to be more suitable compared to microfilm rolls. This is largely due to the fact that it's easier to find a specific page in a strip that contains six frames. However, microfilm rolls are more convenient when it comes to continuous copying compared to the strips. Two dimensional array micrographs tend to carry more pages compared to the microfilm and the microfilm strip. This makes the two dimensional array more convenient for library applications given that their size allows for many more documents to be photographed and saved. Microphotography is also known as microfilming. Essentially, a microfilm is a photographic record used in microphotography. *Other than the roll film, documents are sometimes copied onto a sheet known as a microfiche which can reduce a document to about 0.25 percent of its normal size. Silver halide film is a type of film that uses silver halide a chemical compound that had been used in the photograph industry for the past 150 years. The film has been shown to be the most light sensitive films making ideal for recording greater variance of density and contrast present in the material of interest. This property also provides an advantage in that it allows the film to record high level of detail and consequently provides rich tonal variance. When used in microphotography, silver halide film provides clear images of the highest resolution and thus high quality images when copied and reproduced. This also makes it the film of choice when longevity and quality are intended. The vesicular film is commonly referred to as vesicular because the images formed are composed of vesicles (small bubbles). That is to say that the images formed on the film are made up of small bubbles that are inside the body of the film itself. When in use, heat causes the vesicles to harden as the film is processed. One of the major strengths of vesicular films is that they are fairly resistant to stretching. However, they can be damaged under high heat given that high heat causes the bubbles to deform, which affects the quality of the image(s). With regards to the image, the quality of the image produced using vesicular film is similar to that of Silver Halide film. Because of its capacity to withstand tougher conditions compared to other films, vesicular film has been shown to be ideal for high-use applications. The Diazo films are a type of films that are made up of light-sensitive diazonium. Compared to the other films, Diazo films are inferior and thus used for dispensable material. For this film, the mechanism involves using ammonia fumes for the chemical processing of exposed diazonium salts which in turn produces Azo dyes. The issue with the film is that this dye has the tendency to fade off, which results in the loss of the image. While they tend to be less costly compared to the other types of films, the other two (Vesicular Film and Silver Halide Film) are recommended given that they produce clear, high quality images that can last longer. Essentially, A microform is a micrographic reproduction on a film. To create microforms, special cameras and equipment are required. Planetary and rotary cameras are some of the cameras used to capture images. This is a manually operated camera that is positioned above the document (stationary) to capture images. With a planetary camera, one of the biggest advantages is that it's possible to film various types of permanently bound documents including books and large-sized documents without causing damage The camera is also capable of higher resolution which makes it ideal for documents that are finely-detailed. Also referred to as the flow camera, the rotary camera is an automatic camera. For this camera, the film and documents move synchronously in opposite directions as the images are captured. Images are captured at a faster rate compared to the planetary camera (30,000 images an hour). In addition, a majority of rotary cameras place numbers and blips at the edge of the film, which helps with numbering. A microfilm reader (or reader printer) is used to determine whether the microfilm is ready to be used for reading purposes by users. 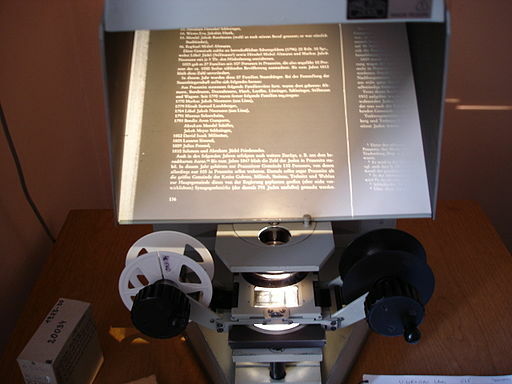 Using a microfilm reader, it becomes possible to observe and evaluate the crispiness of the images as well as the order in which they have been filmed. This is an important process in quality control as it ensures that the films are as they should be before being stored or released for use. Apart from a microfilm reader, it's possible to capture images of the film using a camera. This can easily be achieved by removing the binocular eyepiece of a microscope and attaching a digital lens reflex camera or attaching the camera onto the trinocular eyepiece. With recent advancements, there are many cameras that can be used for these purposes including the Nikon D300 and D3, Olympus C2000/C2020/C3030/C4040Z digital cameras or any suitable DSLR camera. Durability - Durability is one of the biggest advantages of microphotography. Given that microfilms (made of polyester) tend to be stronger compared to the traditional film they can last for a long time (about 500 years) keeping documents safe. In this case, the documents are kept as permanent records. Security - Books and other types of documents cannot maintain their quality because of how they are handled (undergoing tear and wear over time) however, microphotography keeps them safe and available for a long period of time. Such microfilms as the vesicular film and Diazo can be damaged through heat and humidity which can result in loss of data. It can be time consuming to retrieve data with open reel microfilm given that users have to go through the reel sequentially. Micrography - The Making of Microscopic Size Photographs by N G Groom. Microscopy, 1986, 35 (6), pp.445-450. A modern practical guide to making microphotographs on microscope slides. Extreme Resulation; 2nd ed. ; John Wiley & Sons, NY, 1968, pp 2-4. LUTHER, F. Microjilm: a history 1839-1900. Annapolis (Maryland), 1959.